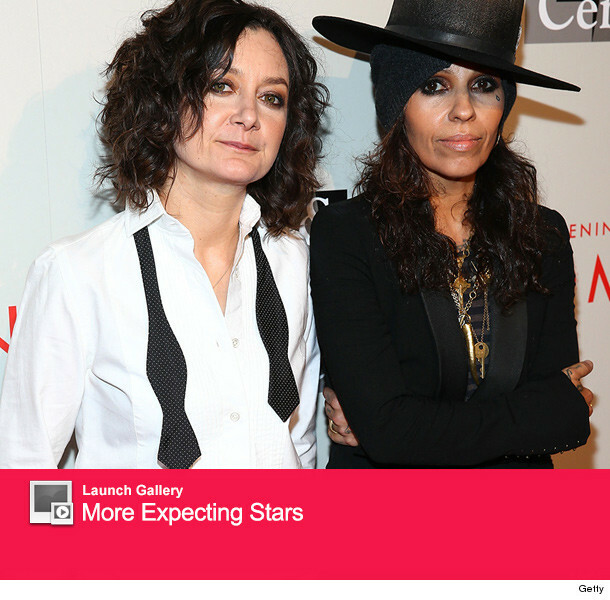 There was a good 2 minutes of all-out screaming on "The Talk" this morning -- after Sara Gilbert announced she's pregnant! The cohosts of the show have been facing their fears all week and today the former "Roseanne" star was set to lay down on a bed of nails while a cinderblock was broken on her stomach. Yeah, it was a very specific and totally random fear, but one she got out of due to the baby news. Gilbert, 39, got very emotional as she revealed her pregnancy, tearing up before finally making the BIG announcement. Julie Chen, Aisha Tyler, Sharon Osbourne and Sheryl Underwood all went totally bananas after Sara's surprise, with Aisha lifting the pint-sized star up and swinging her around. While that probably wasn't the best idea, it was a very sweet moment overall for the entire "Talk" crew. This will be the third child for Gilbert, who has two children with ex Allison Adler, and the first for her new wife Linda Perry. Carrie Underwood Is Pregnant -- See Her Cute Baby Announcement!